Villa Melete is a grand three-bedroom villa in Agios Nikolaos on the east coast of Crete. Perfect for a family-friendly stay. 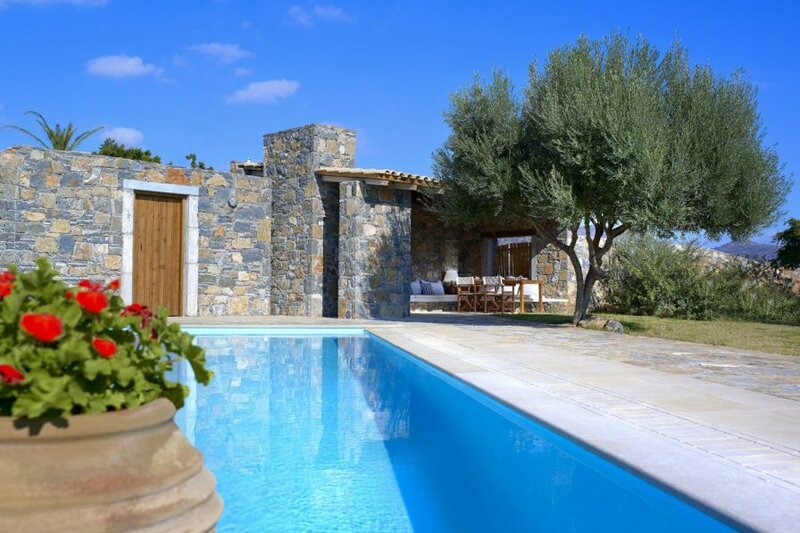 Villa Melete is a grand three-bedroom villa in Agios Nikolaos on the east coast of Crete. Perfect for a family-friendly stay, the Greek villa boasts breath-taking views of Mirabello Bay and has a stone pathway leading down to the sea below for swimming off the rocks. Part of a wider complex, the villa still boasts a private and secluded waterfront location, with access to all the top-notch facilities. The villa is elegantly furnished both outside and inside with rustic stone features, cool contemporary interiors and light white-washed walls. The garden is dotted with trees and plants and has a grass area – perfect for playing or laying down with a book – and a shaded cove with comfortable seats. Stepping inside, you'll find a spacious living room with a TV, dining table and sofas for relaxing on after a long day of exploring. With glass sliding doors, light flows into the villa, and they lead out onto the furnished sun terrace with plenty of places to sit in the sun or the shade. You can cool off in the seawater swimming pool with a hydro-massage jet or rejuvenate on one of the sun loungers. Accommodating five and one baby, you have the choice of one master room with a king-size bed, a second bedroom with twin beds and third with a single bed. The master has a marble-lined en-suite bathroom with luxurious hydro-massage bath, separate WC and walk-in shower, while the other two rooms share an equally decadent bathroom with a walk-in shower. Extra luxe features like make-up mirrors, luxury toiletries, slippers and towels provided add the perfect finishing touches. With individually controlled air-conditioning units in all rooms and Wi-Fi throughout, the facilities at Villa Melete are second to none. For an all-encompassing relaxing stay, breakfast can be brought to your room, and the hotel's restaurants, bars, beach and spa facilities are all a comfortable stroll from the villa through the private peninsula grounds. Agios Nikolaos is a coastal town on the Greek island of Crete. It lies east of the island's capital Heraklion and north of the town of Lerapetra. Full of natural beauty, including white sandy beaches, alongside historic treasures, it's an ideal place for families, friends and couples alike to explore. If you fancy a change of scenery from the eateries at the complex you can head into the centre of Agios Nikolaos. It's a short 1.5km walk from the villa, and there you'll find a range of tavernas, cafes and bars serving both local and international cuisine. You can browse the traditional Greek architecture here too, meander through the winding streets or do a spot of shopping. Popular beaches in the area include Kitroplatia Beach – a sandy stretch close to the amenities of the town – and Almyros Beach – set in a closed cove, with shallow and calm waters perfect for swimming. Further afield are the rural villages of the Lasithi Plateau – a beautiful expanse of green fields interspersed with almond trees and orchards. Offering a sense of secluded rural Crete, you can don your walking shoes or hire bikes and discover the rock-studded mountains of the Dikti range. There are also mythical caves and ancient monasteries for you to discover here. For day trips, the vibrant port city and capital Heraklion is an ideal choice. The vibrant city is home to the Palace of Knossos – an archaeological site that's thousands of years old – traditional villages, Medieval castles, Byzantine monasteries and secluded coves.